My good friend Jill talks about her experiences. Showing us her ID card and goofing around with fellow LCB mates. My first internship took place in the pastry kitchen of Hotel Crillon. Working in this historic property right in the center of Paris was a dream.I have some very fond memories from my time there. I worked there during Christmas so I got to see the kitchen in action during high season! My biggest problem was that I could not speak French at all. However, the team was extremely patient and took time to explain things to me. There were many times where I didn’t know what chef wanted because they spoke only French... and they had to use sign language to show me they wanted – whisk, bowl, spatula etc. It was funny, in Chinese it’s what we call chicken and duck talking. Definitely a story would be when I was cleaning the oven. The kitchen had a giant industrial oven and I literally had to go all the way in (like seriously, I fit inside the oven!) to clean it, I remember saying..."how come it’s so dirty... doesn’t anyone clean it?" then they said to me, “No one could go right inside like you because you are small enough” I didn't know if it was a compliment or insult. I felt like those Chinese gymnastic girls who would do those tricks and stuff themselves into a small box. Overall I was really happy. I got to work for the banquets, in the morning bread section, the pastry line for high tea. A great experience! My second internship was at the Eiffel Tower (!!!) Le Jules Verne by Alain Ducasse. This kitchen had a huge brigade of chefs. There was a prep kitchen at champs de mars and the main kitchen on the 2nd floor of the Eiffel Tower. Yes it sounds amazing. 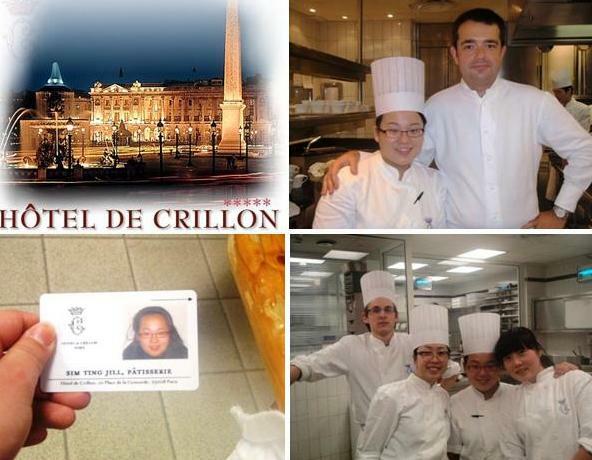 Working in Paris, in a Michelin star restaurant, at the Eiffel Tower! But trust me, after a while, I got sick of looking at the tower and wished it would disappear, especially on those cold winter mornings when I had to drag myself to work. Yet, there is a certain magic about this place. We had the privilege of having a separate elevator that went directly to the restaurant. The highlight of this internship was, once there was a strike and Eiffel tower was closed to the public. However, since we had this private lift we didn’t know about the strike. Imagine having the whole Eiffel tower to yourself! No tourists, no shops, no nothing! It was open only for the employees of the restaurant. Definitely an experience of a lifetime! I’ve done 3 so far. All have required me to speak French and that’s how I learned – the hard way. 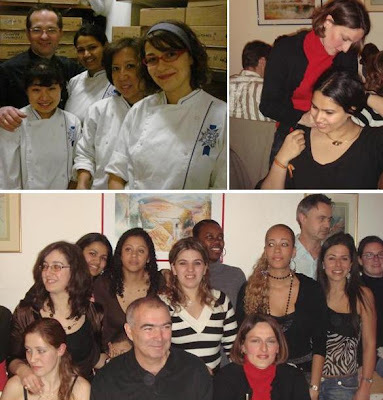 My very first internship was in the kitchen of a 4 star hotel in Montreux, Switzerland. Did I mention I was the only employee? When my school told me I would be in charge of breakfast service at this picturesque B & B I was ecstatic. A charming little hotel right opposite Lake Geneva, the whole place just looked like it was meant to be on a postcard. Breakfast is my favorite meal, so I thought how hard can it be. Boy, was I wrong. I was solely in charge of breakfast for over 60 guests (during the Jazz festival, almost 100). This meant serving coffee (I prayed that no one ordered a cappuccino! ), arranging the buffet table, cutting cheese, meat, making eggs (omelet, scrambled, fried, poached), baking croissants (I burnt so many batches!) and the cleaning, dishwashing, vacuuming, store keeping, ordering stock and then doing mini-bar service. Oh, and all this had to be done wearing high heels. 6 years later, my feet still haven’t recovered! I was barely 18, determined to do a good job. I was living all alone in Montreux. No friends, no family and no one who spoke English, and to add to it an evil boss who made me cry at work almost every alternate day! Eventually I succumbed to the pressure and quit this job in 3 months. At 21, after I finished school, I was determined to complete a 6 month internship in Switzerland. So I joined a 5 star hotel in Vevey. And it was the complete opposite of the first one! I had a great team of employees, I spoke French by then and made many friends, I learned almost everything I could and my most memorable moment was being sent off with a surprise party with over 40 staff members. This time, I cried for a different reason! So my point here is simple: don’t give up. It may seem hard, it may seem like the end of the world, but it will get better. Saying that, know that there is a difference between work being hard and being hell. Having been through hell at my first job I also learnt that you should know your limits and there’s nothing wrong in admitting you can’t do it. There is a world of opportunities for learning as an intern and I would recommend any budding chef to do as many internships as possible. Good luck and bon courage! P.S: Would love to hear your internship stories! Raising your force for the kid, along with looking for prom breitling replica sale could grown to be a new combat pertaining to worry. The truly great reports can be you will discover nighttime luggage designed for each and every system variety along with luggage fashion. Comply with these kind of uncomplicated recommendations to learn elegant fake hermes that leave anyone look along with experience very good. Options the hourglass most your luggage that will high light your ex amount. Getting in touch with care about the core developing a equipped bodice as well as corset, as well as get towards natural classiness, developing a attend involving breitling replica uk. Produce along with coloring permutations in addition additional will certainly last effectively. If however, you always be petite, by way of example, you may wish to spice up one's body as well as your current lower limbs look extended. Luggage besides To select from must be considered. First, to select from that will deal with your current neckline are perfect throughout Cameras to defend anyone through the very hot sun's rays. Hermes replica handbags you have to in the strolling variety and also light-weight. Carry your current sneaker frames to your lowest. A couple pertaining to going in luggage in addition to a match for you to delight in your everyday situations. While common, your current dior replica are generally a necessary portion of your current storage room.